At the altar of the terrible one. I’m the ash flying in your face. I’m in you and you and you. To conceive and birth such a thing as you. You remind me of morning afters and soiled sheets. You remind me of clenched fists and unending kisses. To see if you were normal. But tonight I’m the mother I never was. I can hold you in my arms and look you in the eye. Of being made to look pathetic. So what if I did not want you? As we breathe against each other. And dream and wake and dream again. Red, black and blue like scars. Bright as a child’s laughter. Astride word-clouds tinted rose and red! Secret soiree of my tired soul. I want to see the twinkle in your almond eyes. And try and believe that’s all there is to you. Do not laugh, I say! So forgetful. So light. So random. It’s almost cruel to be so. I wish I could forget you by the next showers. Several years ago, my friends and I went to visit the Ajanta caves in Maharashtra. 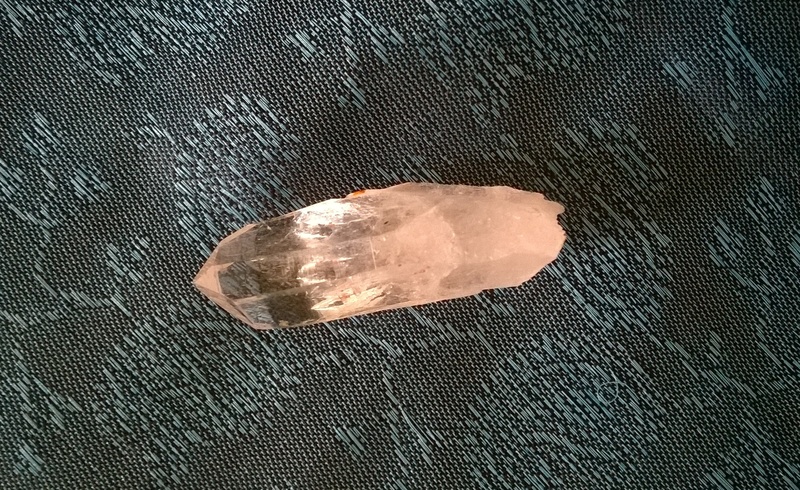 A stranger there offered us this stone along with two palms full of raw, uncut amethysts. I don’t know where the other stones are but I discovered this piece in one of my little treasure boxes. While inspecting each cave, we took a particular fancy for a statue of Buddha with his right arm broken from its elbow. The insides of the broken arm glistened white and violet in the artificial light. After going through all the caves we followed some other visitors across a bridge and up the hill opposite to the caves. The Ajanta caves are placed in a neat row in a horse-shoe formation by the gorge of a river. The hill opposite gives a breath-taking view of all the caves, we could guess. But the climb was steep and the few visitors ahead of us gave up and started climbing down in a while, owing to the fierce afternoon sun. We went ahead. In a while we reached a plateau that arched off into the distance, cut off from the skies by the dense branches of dried up dead trees. The little grass that was there had yellowed. It looked desolate and scary. Turning back, we could see the tiny rows of caves in the opposite bank, some of which caught the afternoon sun. Ancient monks worked inside the darkness of the caves to carve out those exquisite sculptures following this sun, we blurted in unison. Just then a man approached us. Tall and wearing a well worn shirt and trousers, he came up and started a conversation. I don’t remember what we spoke about until he asked us to follow him—”I’ll show you around”—he said. We hesitated. But curiosity got the better of us. He guided us through the dead trees and shrubs and showed us the river valley that looked like the peninsula of India. He said that he was a farmer. But he liked to observe and talk with visitors from across the world when he was not busy in his field. And then after some more small talk, he said he had been collecting stones. “It sells well and they’re easy to find if you know how to spot them”. And then he delved into his pockets and produced two palms full of stones. “For you”, he smiled and stretched out his arms. The stones, grey and unimpressive on the outside, glistened white and violet like the arm of the Buddha we had seen inside the cave. Dumbfounded, we accepted his gift. We did not have the heart or the gall to offer him any money. I don’t remember his name or his face even. He lingers in my memory like an apparition in that endless wasteland, observing people and giving them little lessons in humanity sometimes. I keep reading that it’s not safe for women to travel alone in India. The US government has, for example, issued several advisories in the past about the dangers of travelling to India given that several ghastly assaults on women have been reported in the recent months and years. As a result, when I planned my travel and read up on blogs and forums, I found that safety for women travellers are a major topic of discussion. Obviously the very fact that there’s so much of discussion going on about women’s safety in India—particularly for travellers—clouds your travel plans with awful premonitions. However, as an Indian and a woman who has travelled across much of east, west and north of India in groups as well as by myself, I find it a little too overhyped. Sure, there are rowdy people, cheats, touts, beggars, and inquisitive, annoying aunties—but once you spread your soul out on your travels you realize that there are an aweful number of surprisingly nice people that you had no idea about. So when I started seriously considering a solo vacation to the hills, I was in two minds. There were all these discussions—primarily amongst travellers from western countries who link “safety” to the kind of clothes they wear. The overriding presumption is that people in the west won’t harm you no matter how short your skirt or cropped your top is, but in India it means you’re inviting trouble. For anyone reading this, I want you to know that it’s a non-issue. People in India will stare, but criminality has got nothing to do with attire—just as anywhere else. The more pressing issue is the apparent lack of law enforcement which enables crimes to go unreported, justice delayed, and therefore a pall of fear develops regarding the lack of safety. However, it’s all empty talk without actual, hard evidence. As a resident of the National Capital Region (NCR/Delhi), I live with the constant awareness that I’m not safe. People don’t walk much, they drive—even if it’s to buy milk in the morning. The roads aren’t safe, for anyone can attack you. I was once groped less than 50 metres from my home. People don’t come to help others in trouble, for you never know which minister’s or business tycoon’s son is the trouble maker and you don’t want to get into trouble. This is my reality and this, I’m told, is one of the most unsafe places in India. Surely, If I go somewhere on a vacation, it won’t be worse than this—I told myself. Besides, my own experience in towns and villages outside of the big cities have been rather pleasant. The real kick came when I heard that a former colleague had suddenly passed away. My travel plans were all but cancelled before that. I had no tickets; all my friends jettisoned the idea for a variety of reasons; and yet my leaves were approved and I wasn’t ready to cancel my leaves. At that moment—while I communicated with other friends to find out if the news of my colleague’s death was not a bad joke—I was overwhelmed with a strange feeling of time passing by. Life is short, I realised. It’s wasteful to let time slip by doing nothing owing to fear or laziness or lack of company. I thought about my colleague and the long conversations we once used to have about art and felt—selfishly—what a gift it is to be alive. I bought a bus ticket online, packed my bags, surprised (shocked?) my husband by informing him that I was going, and I was off. At the backend, of course, it took me several hours of intensive work to cook my dogs’ food, write out instructions, and research on hotels and prices. I made no bookings, though. It was my dream to wander by tall dark trees amongst the mountains. A tiny house and river features in that dream too. And ever since I heard of Kasol from my brother, my dreamscapes were tied to that tiny village with a clear, bouncing river. Kasol is a small village by the river Parvati in the state of Himachal Pradesh. I did not have the time to go through my original itinerary covering the northern parts of Himachal Pradesh—especially because I decided to not hire cabs. Hiring cabs for travel saves time, but it isolates you from experiencing the local culture, and it’s one of those things that might lead to trouble. 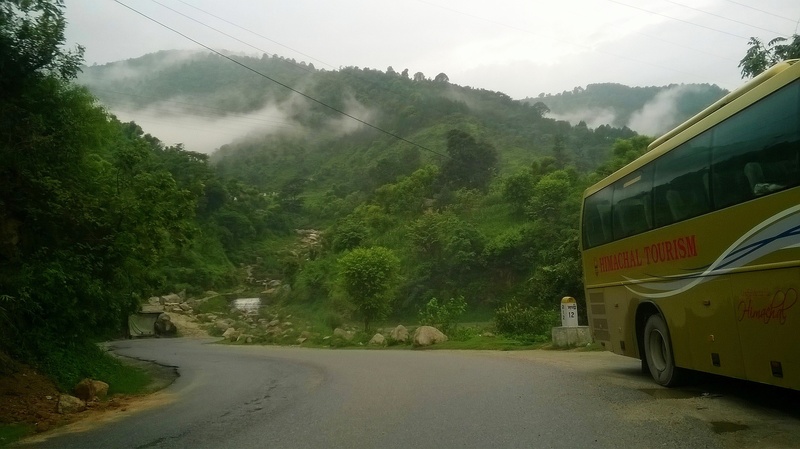 My bus started from Delhi at 7.30 and was scheduled to reach Bhunter, a small town that served as a junction between Manali and Kasol, at 8 the following morning. The bus was awesome. It was an HPTDC volvo (which you can book online from here) that was half empty, and because it had an abundance of emergency bags, I had no trouble while puking early in the morning as we climbed higher and higher. I had had dinner by the roadside in the plains and an early morning tea in the hills. Here’s the first shot I took with my phone as I sipped my tea and enjoyed the mist and light drizzle. An amazing morning. An amazing bus. “I don’t know this place, but this is where I had to get down to reach Kasol”. “Do you know anyone in Kasol? My parents and husband would have been very flustered with the idea of my going to the hills with a bunch of friends to party. But auntie here seemed to be satisfied that at least I wouldn’t be alone. Perspectives! So auntie and company spoke to the cab drivers waiting for passengers and asked the cab drivers to put me up on a bus. While all this was happening, a bus came by, and I said a hearty goodbye and boarded the bus, leaving auntie with her fears. “Yes, I’m going on a vacation”. Brief silence. Thank god for beautiful mountains, the chatter soon filled up the little discomfiture. When I reached Kasol, it was almost noon. I walked around a bit trying to find the hotel I had rung up. There were no rooms available but they had asked me to come and check in person, in case someone vacated, and they had, what seemed to me from the pictures, the best position by the Parvati. The hotel was situated in the centre of the village and right by the river—its garden restaurant hanging from a jutting piece of cliff over the river. The most astounding thing about the place was the roaring of Parvati in spate. 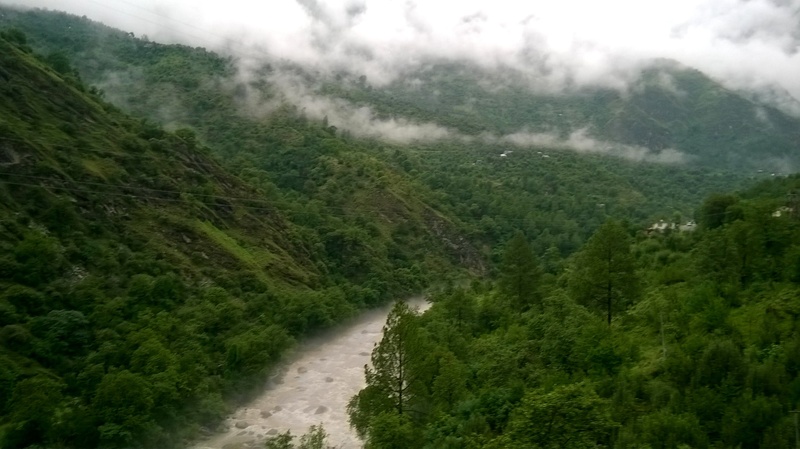 I had seen photos of the Parvati as a limpid blue stream, but what I saw in person was a terrifying white and brown foam, with a constant haze over it, rumbling down the valley with a mighty roar. I waited for an hour sipping coffee and contemplating the river before I was told that they had a room for me. It was on the ground floor, damp, and not very nice. However, I was hooked to the river, or it’s sound rather, and decided to take it. After lunch, I set out to explore the village. 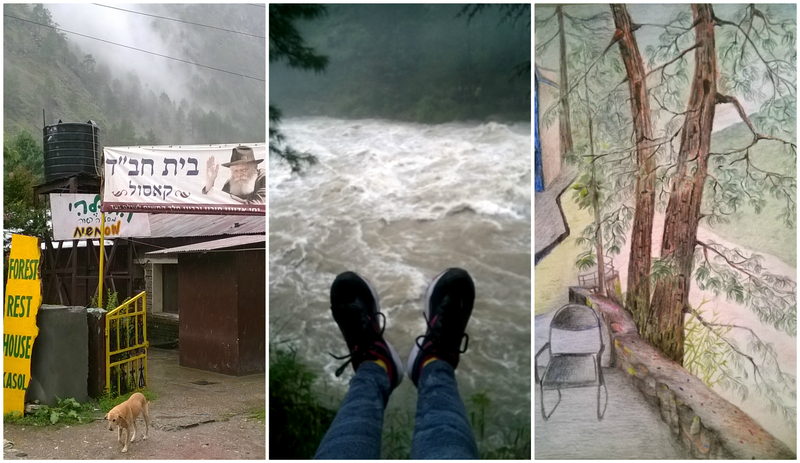 Kasol has changed much since the time my brother described it to me almost a decade ago. Although a small village, it’s overflowing with westerners and its streets are lined with cafes and restaurants selling Italian, continental and Israeli food. Israeli tourists seemed to outnumber others since I also noticed billboards written in Hebrew and a Chabad House! My intention was to find the bridge that I could see from my hotel so I could go past the river on the other side where there seemed to be a narrow forest trail by the the tall mountain. As I walked, scores of the bikers I described earlier passed by—leering, hooting and generally having “fun”. They were supposedly on a pilgrimage to Manikaran, which is about 14 Km from Kasol. I felt quite disgruntled. “Why must I have to deal with such assholes outside Delhi as well?” I complained to myself and kept walking. I was determined to not let unnecessary intrusions affect my mood (which was already affected) and I only turned back when it started raining. I took shelter in a shop, chatted with a local lady, bought a shawl from another shopkeeper and spent an hour or more there. 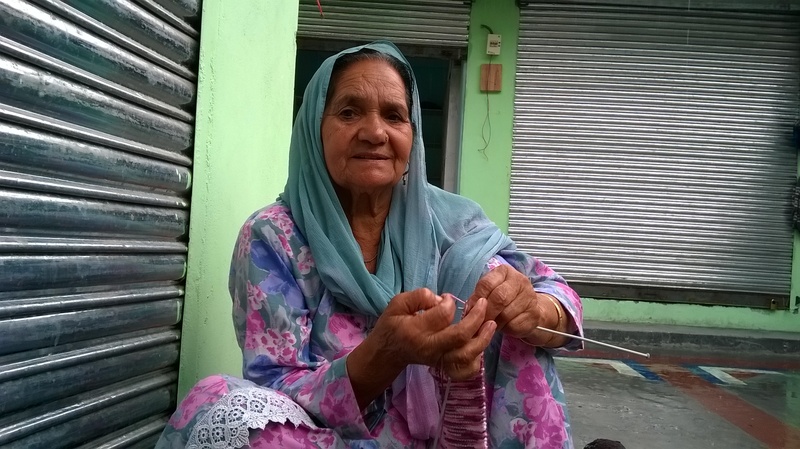 Roop Kumari auntie, the local lady, told me that monsoons had become increasingly dangerous with landslides occurring more often over the years. She also asked me about my friends, and when I told her that I came by myself, discouraged me from wandering by myself. As I walked back, darkness descended suddenly, as it often does in the hills, but not being used to it, I increased my pace. And I took a terrible decision. I reasoned with myself at that moment that since I could not go further north and couldn’t go for the 8 hour trek to Kheer Ganga by myself either, I’d rather head back home. So I went to the nearest travel agent and booked a ticket back to Delhi for the following day. Back in the hotel, I took my sketching things outside and sat in the drizzle for a couple of hours—sitting astride a parapet hanging over the river—and sketched. I got up to go inside only when I began to feel really cold, and the cold made me see less, and the drizzle got the better of my already wet unruly hair and blotched my water colour pencil sketch in several places. Even as I tore myself away from the cold and rain and that roaring river, I went in and continued filling the page with colour until I fell asleep over it. Happiness. The next morning I awoke with a start. It was not yet 7 a.m. The skies seemed to be clear and I was feeling like I could conquer the world. Instantly I regretted my decision to purchase that ticket back to Delhi. “I could jolly well laze around here another full day even if I didn’t go anywhere, I reasoned.” To make up for my self-imposed time constraint, I set out early, found the bridge and crossed over for a short trek to the next village, Chalal. This was every bit my dream landscape and like a sleep walker I went ahead instinctively, stopping only to gasp at the river or peer at the unending pine trunks up, down, and all around me. This was the winding road I could see partially from my hotel. It was laden with dried pine leaves most of the way, and I kept collecting rounded pine cones whenever I spotted one. By the time I reached Chalal, I was too hungry to think of anything else and hence made my way up to a restaurant. As I waited for my aloo parantha, I chatted with friends on the phone. On my way back, I crossed the shrubbery and went right up to the river and spent an hour lying down, staring at the sky and listening to the river. I was not happy with myself for having purchased the return ticket in a knee-jerk reaction to a minor discomfiture caused by some overenthusiastic men. Or perhaps the repeated nay sayers and discouragement made me nervous. However, it’s a valuable lesson for me for my future trips: Even if everything does not go according to plan, one needs only to do what one loves, get over the negativity and brace oneself for the world. It’s more about one’s own attitude towards the world than about strangers’ attitude to oneself that determines one’s experience. Summarily, I have decided to never listen to my reactive mind, no matter how vulnerable I feel or attractive the option seemed at the moment—I must let myself soak in the environment and give myself time to switch on my explorer mode, before I purchased return tickets from anywhere. Note to self: It pertains to return tickets only. Yet I was quite merry in the jam-packed bus that I boarded for my return to Bhunter. In Bhunter I waited for more than hour before the bus to Delhi arrived. I was hungry and wanted to eat, but strangely, most of the shops were closed. Hence all I managed was a cup of tea. No sooner had the bus started than I began to feel funny. Funny led to nausea. And within an hour I was shifting in my seat constantly, cowering in the cold blast from the air conditioner, and fearing for the passenger next to me—for I could puke any moment, and the only saving grace in the entire scenario was that my stomach was empty. I’m one of those optimists who refuse to carry medications for motion sickness or nausea. I believe it won’t happen again although it happens every time. Secretly, of course, I feel embarrassed for being such a sissy. However, by the time the bus stopped for dinner—which was almost midnight—by a dark highway lit up only by two food joints, I was feeling terrible. I stepped out and paced up and down by the highway as people flooded into the dining room for their dinner. Some people peered, some stared openly at my antics, and there were some bikers too but no one bothered me with small talk. Perhaps there was something about my pacing that told people off for I was in a mood to kill. I was still pacing and surprised, I said “Hello”. “How long do you think the bus will stop here?” he asked in a heavily accented English. I didn’t get what he said but I realized he was a little embarrassed about it. I wondered for a second if I should ask whether he was carrying any medicines, but decided against further conversation. I finally did ask for a medicine from a group which had spent their evening staring at me at my hotel as I sat and sketched in the rain. Note to self: Travel solo and learn social skills.